Gare du Lyon is starting to see the end of reconstruction work and passengers arriving at the station cannot fail to be impressed by the line of TGVs heading south to Lyon and beyond. 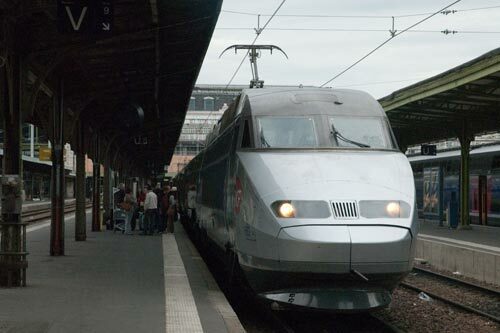 In recent years there has been an increase in international trains from this station and on a sunny Saturday in late July I arrived early to grad a coffee and croissant before boarding train TGV9241 to Milano Centrale with a scheduled time of departure at 0742. A single 8-car set, TGV Reseau three voltage set 4503, was in the platform with many people thronging to board the train. The Milano service is operated by Artesia, which is a joint venture between French railways (SNCF) and Trenitalia (FS). Recent reports about the health of this partnership do not suggest that the arrangement will be long lasting as there is considerable friction between the companies concerned. Despite this potential problem the train left on time and headed out through the Paris suburbs to join the original high speed line south towards Lyon. Much has been written about this route, travel over which has become commonplace with the high speed that was once unique in Europe now becoming the norm. The train leaves the high speed route just south of Mâcon and from now on you can expect a gentle trundle through the countryside. The route avoids Mâcon completely and the next station of note is Bourg-en-Bresse. At this point is becomes clear that the train is heading into mountainous country. The route turns south to Ambérieu through a landscape that is improving rapidly. As you progress you realise that once considerable railway infrastructure has suffered from the loss of freight from rail to road. It is also clear that many once thriving rural factories have closed with their redundant shells rotting beside the line. On to Culoz, an important rail junction is soon reached, with the railway now meandering up a deep valley. From Culoz the scenery opens out with limestone crags on either side of the line. Soon the Lac du Bourget comes into view on the right hand side and the east bank of this fine lake is followed to the important resort and spa of Aix-les-bains. Another two of railway importance is Chambery and this is passed without a stop. Continuing through improving mountain scenery to train stops at St. Jean de Maurienne and St Michel-Valloire. Even in high summer snow can been seen in the gullies of the mountains, those on the left hand side of the line being part of the rugged Ecrins National Park. The last stop in France is Modane with the town appearing to have a thriving economy probably based on traffic across the border into Italy. Here you will see some of the ample freight traffic across this route. With a new Italian train crew and customs officers on board the train initially heads north east out of the station before turning through 180 degrees to enter the Fréjus Rail Tunnel (also called Mont Cenis Tunnel). 13.7 km (8.5 mi) long, construction was started in 1857 with the tunnel opening for traffic in 1871. In the tunnel the line climbs very steeply to the border before descending at a gentler angle to Bardonecchia. Having left Modane on time, slow progress was made through the tunnel and we left the first Italian station on the journey some 10 minutes behind schedule. Further time was lost to Oulx, the next stop, although the scenery on this section is good especially if you have a good view to the left. More time was lost through poor train operation and by the time we arrived in Torino Porta Susa we were some 30 minutes late. The journey from the French border generally follows a broad bottomed valley that is quite built up but above soar wonderful mountains. 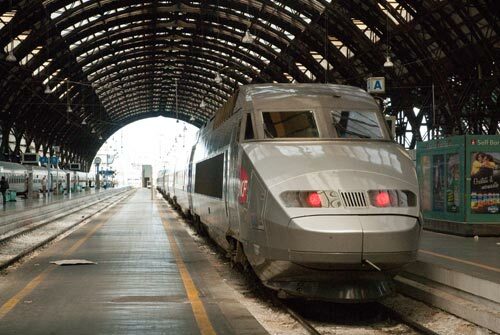 Photo - Arrival of the TGV Artesia service from Paris at Milano Centrale. Tornio Porta Susa is a depressing underground station and it is good to return to daylight. Sadly little is seen of Torino and you have to be content with glimpses of the suburbs. As the train heads towards Novara, where the final stop is made, speed is somewhat better as you cross the flat land on the approach to Milano Centrale. In true Italian style further time is lost and arrival in Milano was 38 minutes late. Despite the inconvenience of late-running you soon feel less depressed as you detrain under the wonderful arched roof of this magnificent station. If possible spend some time looking at this magnificent architectural masterpiece as every detail reflects the care taken in its design.